With these 5 extraordinary motorhomes, let’s take a walk on the motorhome and caravan market to discover all that is available to us! Today, more and more people are choosing to travel by caravan and motorhome, since they make traveling easier and allow us to go wherever we want. Caravans and motorhomes have evolved a lot in recent years and we can find all sorts and for all tastes, a comfortable, easy and economical way to travel! Between style, design, comfort, … discover our list of the 5 extraordinary motorhomes, you will not be disappointed with the trip ! 1. Element Palazzo by Luigi Colani Let’s start our selection of the 5 extraordinary motorhomes with the Element Palazzo designed by Luigi Colani with an interior capacity of 43,66m2 when it is on the move but can reach 71,9m2 when it is stopped. 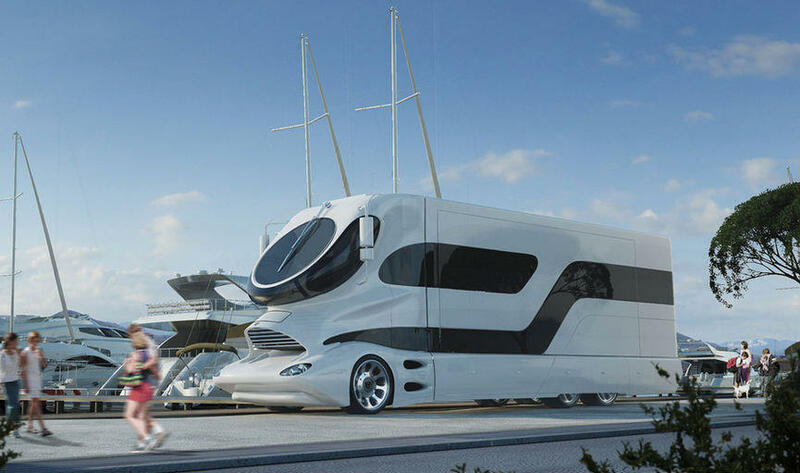 One of the most luxurious motorhomes in the world. A high-end model with innovative features and unbeatable comfort ! 2. 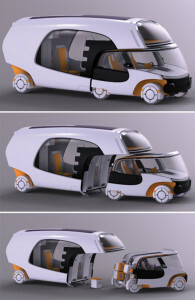 Volkner Mobil A unique concept and surprising agility for the size of the vehicle ! This motorhome looks like a huge bus but it has all the luxury of the world… With an interior decorated with luxury furniture, high quality leather and natural wood, you will not be disappointed… And moreover, there is a garage to transport your car, and a 460 horsepower engine, fantastic ! 3. Wolkswagen Westfalia by Alexandre Verdier Among our selection of 5 extraordinary motorhomes how not to mention this solar model of the brand Volkswagen. 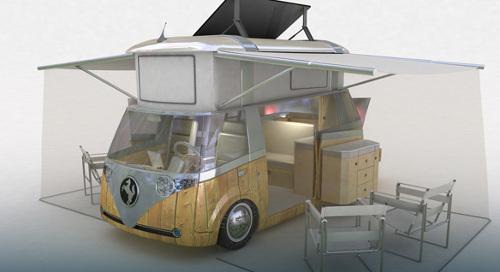 This model uses the design and spirit of the mythical 1960s caravan with incredible improvement s: solar panels, rooftop cockpit, transportable kitchen, and much more to discover ! 4. 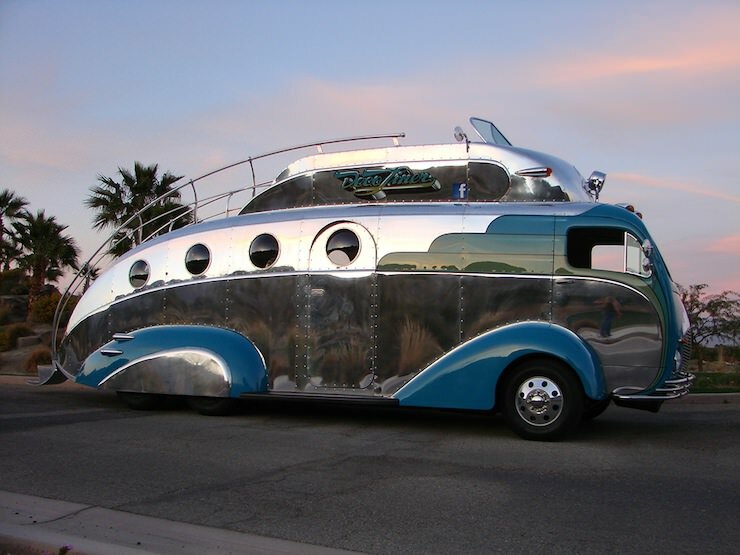 The Decoliner by Randy Grubb The Decoliner, this « almost » motorhome is also part of our list of 5 extraordinary motorhomes ! With these two driving positions and its futuristic, nuclear or other style according to your imagination, makes this model a true masterpiece. 5. Colim by Christian Susana Compact car, caravan or motorhome, this modular vehicle called Colim (Colors of Life In Motion) attracts a huge numbers of travelers. No more worries about moving with your motorhome even in the narrowest streets ! 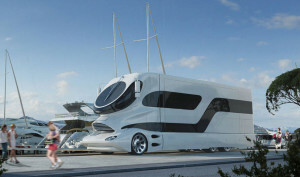 So, which one do you prefer among our list of the 5 extraordinary motorhomes ? Do not hesitate to send us your suggestions for extending our list of these beautiful motorhomes ! And above all, enjoy your trip with CaraMaps !